I recently received some samples of the Shea Moisture Curl Enhancing Smoothie! I must admit that I’ve heard sooooo much about the Shea Moisture line but I still never tried it. Yesterday, I was rocking a bun but my hair was extremely dry. When I took my bun down I lightly spritzed my hair with water (specifically the ends) and added a dime size amount of the Curl Enhancing Smoothie. My hair had been in a bun the day before so my curls were dull and undefined. As soon as I added the styler my curls immediately bounced back into place. The scent of the product is amazing! It smells very sweet, but light sweet at the same time (if that makes sense). It has a very creamy texture, it almost looks like it can pass for a conditioning masque of some sort. After adding the smoothie to my ends, I added some more to my hairline. It worked wonders! My hair laid down easily and had INSTANT shine!!!!! No need to draw this out any more…this product gets an A in my book! I’m not a big fan of doing twist outs with cream based products but I can’t wait to try the smoothie as my styler for my next set of twists!!! This product can also be used as a deep conditioner! So, it serves two purposes!! The ingredients are all natural and organic! ALWAYS A PLUS!! 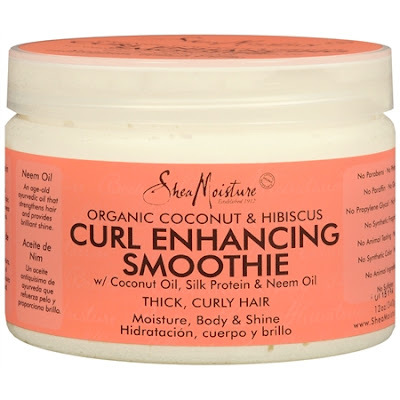 Have you tried Shea Moisture Curl Enhancing Smoothie before??? What were your results? Sound off below! Next Post Yogurt in my natural hair—SAY WHAT? I've heard a lot of talk about this product, and the entire line, on naturallycurly.come but never tried it for myself. I didn't know it could be picked up at target for $10! I was under the impression it was much more expensive, I'm going to pick it up next time I'm out =] Thanks for the review! Alysa–I didn't know it was that affordable either!!! Def picking up the full size jar this weekend…so worth it! Sheamoisture is also at walgreens if any of you have one close to you. They are currently on sale at the Shea Moisture pop-up shop in Bryant Park if you are in the NYC area 3 for $20. I love their products I use the Moisture Retention Shampoo in the winter as well as their Deep Treatment Hair Masque. That's really their best product I've tried so far, you can deep condition with it or use it as a styling product and it really adds shine, bounce and longevity to curls. I have gone through 2 tubs of this product since I have been natural (about 2 years now). I swear by this product. Natasha like you said it is great for hair that is a few days old. I believe if its not broke don't fix it. I will be using this product for a while until my hair tells me otherwise.